This blog entry was inspired by a really cool website I came across that you might like as well. Go check it out! It's such a unique concept. If you enjoy Project Runway, you will be fascinated by this blog. Since my seamstress skills are non-existent, I am relegated to buy things ready to wear! Below you will find my recent vintage clothing finds. I just LOVE the styles, cuts, quality and fabric of these lovely old frocks. This is my dress form "Audrey", as she is dressed in her every day attire. 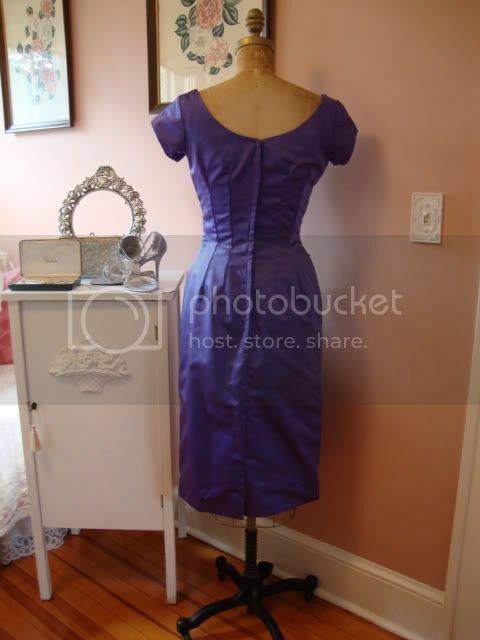 Doesn't everyone wear their 1950's party dress to stand around the house? It's not like she is scrubbing the bathroom, but I really wish she would pitch in from time to time! Such the princess! This dress was an ebay find from a few years back. This sweet dress has a floral print with a pink sash and pink ribbon around the hem. There are no tags and it appears to be hand made. There is a slip attached to the garment which is sandwiched between 2 tiers of crinoline which is EXACTLY what makes it a PARTY DRESS! 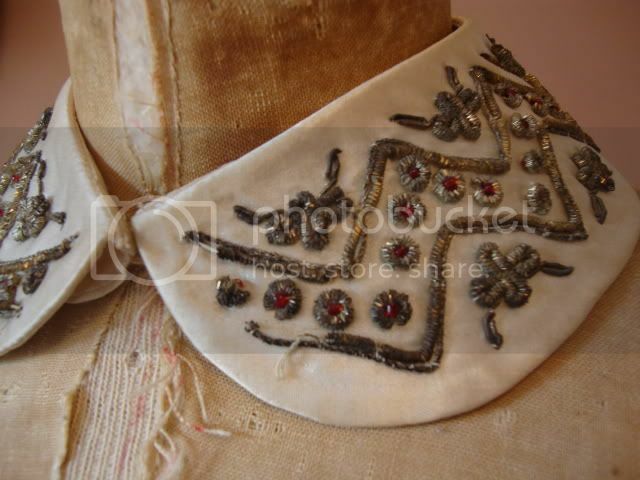 This beaded collar belonged to my beautiful Aunt Rose. The tag on this color says it was made in India. 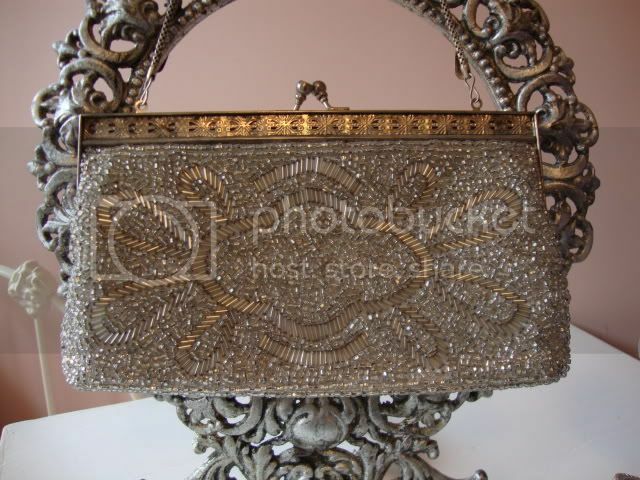 It has fine metallic beading with garnet colored inset stones. My Aunt Rose had the best vintage clothes and I have been wearing them since I was 16 years old (let's just say it's been MANY years). One day when I get to my attic, I will pull out some of the super duper couture items she bestowed upon me. I cherish them as I do her! 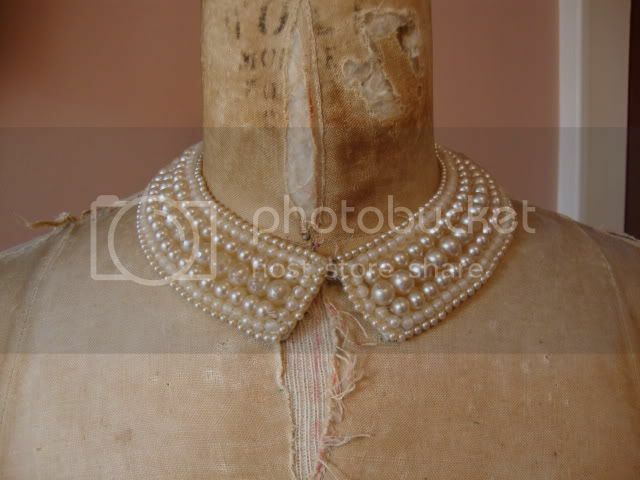 This pearl collar belonged to my own Mother. I have seen them at estate sales and thrift stores as they are fairly common. I just adore them. Sweet and feminine! 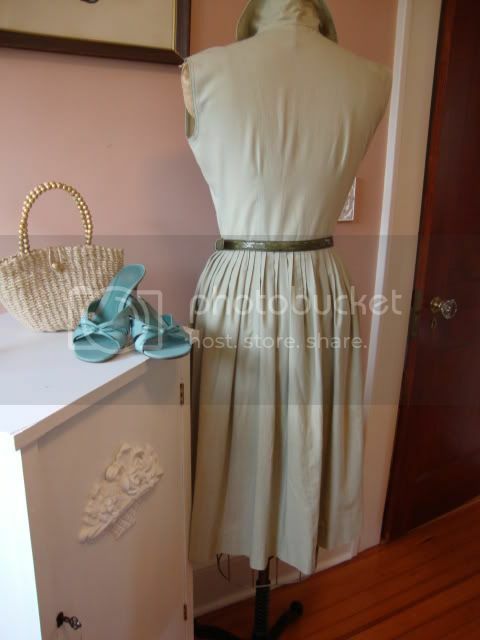 This very cool green vintage shirt dress was found at Linda's Perennial Clothing in Islip, New York. This store is petite in size but jam packed with style! 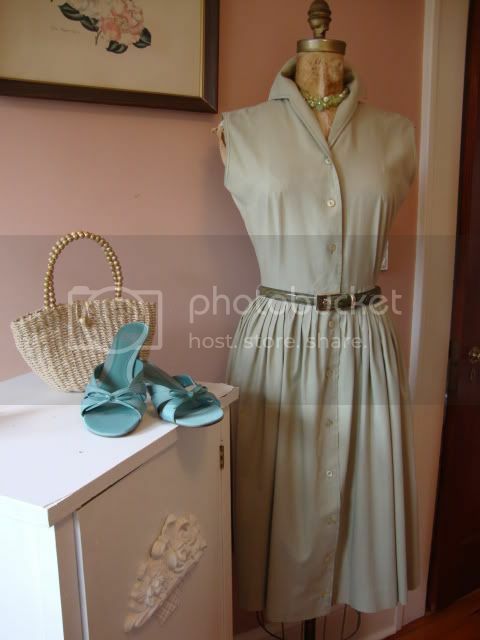 If you live close by and love vintage clothes, you must stop in. 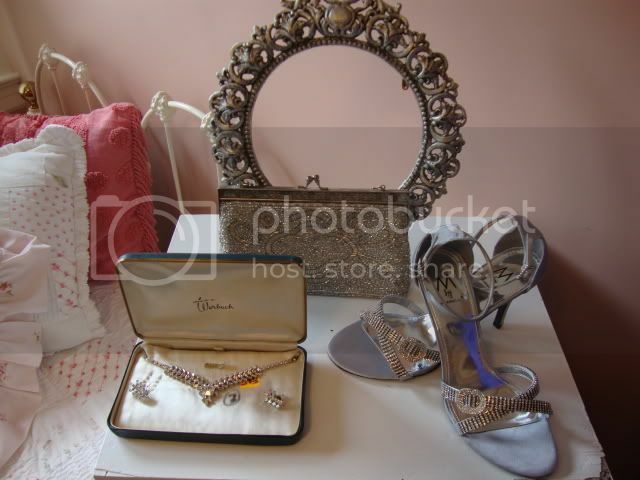 You can purchase the clothes, bags, shoes and jewelry or, Linda does loan out some pieces for special events. She is a very sweet, kind and helpful shop owner. I highly recommend this boutique! It's a nice day trip with a girlfriend as there are a few excellent restaurants in the village and a great antique store across the street. The antique store was once an old vaudeville theatre and the current owners are trying to restore some of the stage back to it's heyday. Check it out! This dress I wore recently to my cousin-to-be's garden bridal shower. The pleating at the waist is so fabulous, something one does not see in today's garments. Even the fabric is superior as I wore this the entire day, out of state, in the car and the darn thing didn't wrinkle! The manufacturer of this fun dress is Avalon of New York. The following 2 items I purchase on impulse at Cheap Jacks in Manhattan where I spent WAY more than I should have. They were impulse buys while on a day trip with a girlfriend to see a play. I have seen comparable black sweaters for much less at a local consignment shop. Oh well! Live and learn! 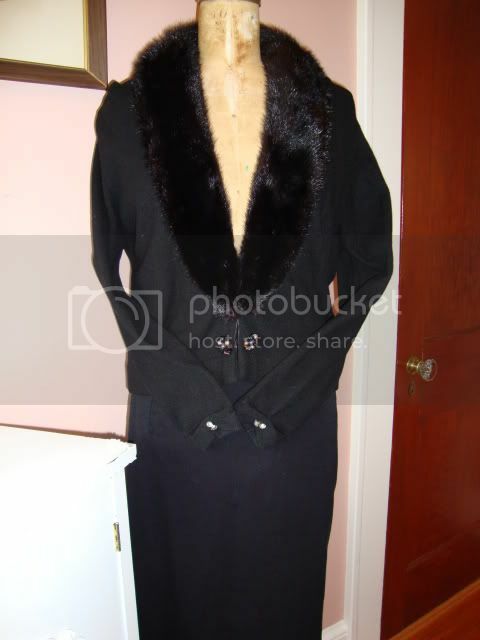 This black cashmere cardigan has a detachable fur collar, 3 hook and eye clasps at the waist and a dash of bling on the cuffs and clasp. I actually wore it the day I bought it as it was chilly out and I needed something. Hence the impulse buy. The inside of the sweater is lined with off white lace and a layer of black chiffon. The tag says 100% cashmere and the maker is Moritz. This piece I absolutely love but I have to say, it takes an awful picture! 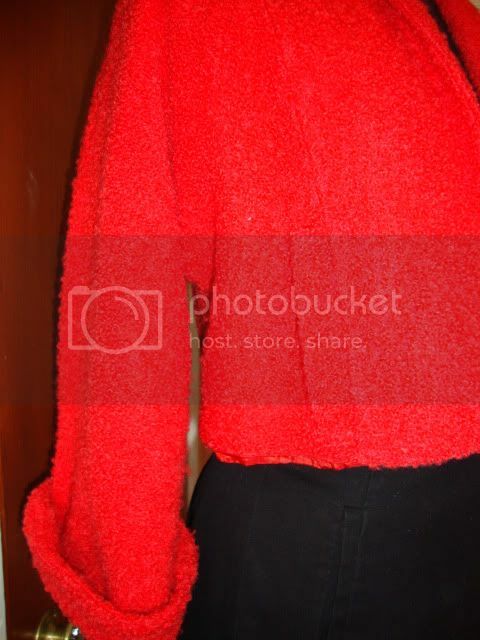 The color is a rich tomato red, not the neon color in the photo. 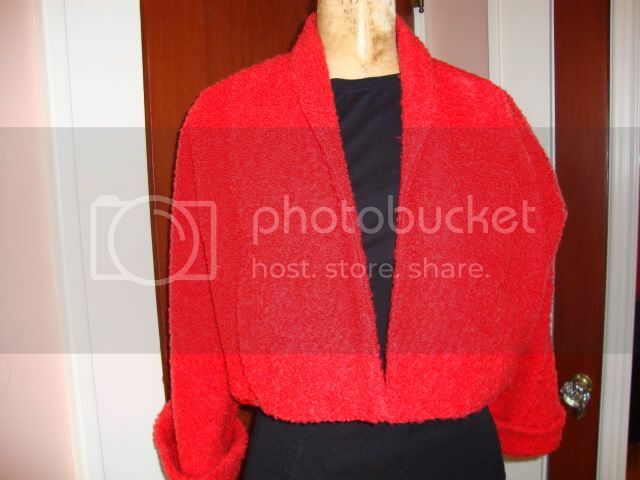 This is a cropped jacket with vertical pockets on each side. The sleeves are great because they have a bell shape to them and can be worn straight or with a cuff. The tag only states, Bonwit Teller. There is no information on the fabric. It's a nubby texture. Please leave me a comment if you know what this fabric is called. I'm curious! I just ADORE this dress! This amazing wiggle dress was won on ebay. It is handmade with an attached lining. 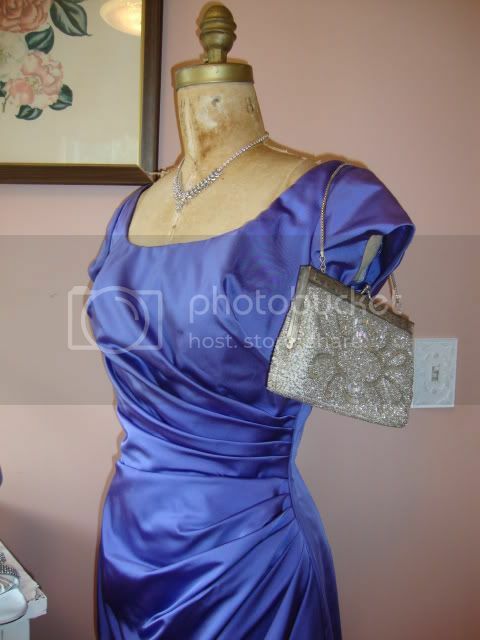 It's a gorgeous heavy purple satin fabric. It cinches on the left which creates a pleating effect across the body. The length is currently mid-calf. I will be wearing it to my cousin's upcoming wedding but before I do, alterations need to be made. I cannot wait to wear this amazing dress!!!! Below are the accessories for this ensemble. This is the vintage bag I found at the local thrift store. Can you believe it was only $2.00? I bought it a while back with no specific intention for using it. I just couldn't leave it behind for that price. It has been hanging on my vanity mirror awaiting the day it would be called to service. Okay, nothing vintage about the shoes. However, shoes are one of my favorite clothing items so, I just couldn't leave them out. 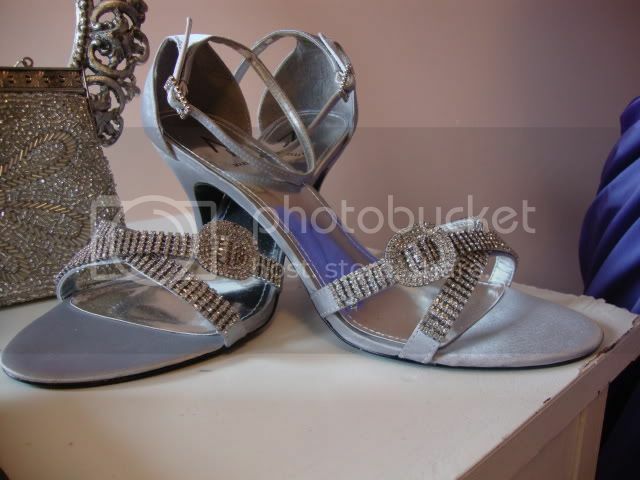 The silvery rhinestone shoes are by Marinelli. 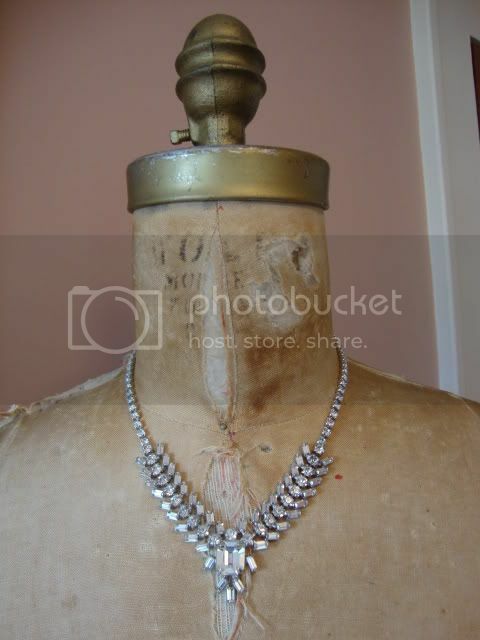 This dynamite necklace is part of a set I found at a local thrift store some time ago. They were asking a ridiculous amount of money for this set but it was my lucky day, it was on sale for half off! This will be the first time I wear it as it's difficult to pull off flashy rhinestones at the grocery store. I tried that in the 80's and I just ended up looking cheap and tacky. The set included a pair of earrings which have the old fashioned screw backs. I need to get these altered for pierced ears before the big event. This ensemble came in it's original box. The manufacturer is Werbach and there is a label that states it was hand made. There you have it, a few of my favorite vintage couture treasures. I hope you enjoyed viewing them as I have enjoyed hunting them down. Please leave a comment and a link. 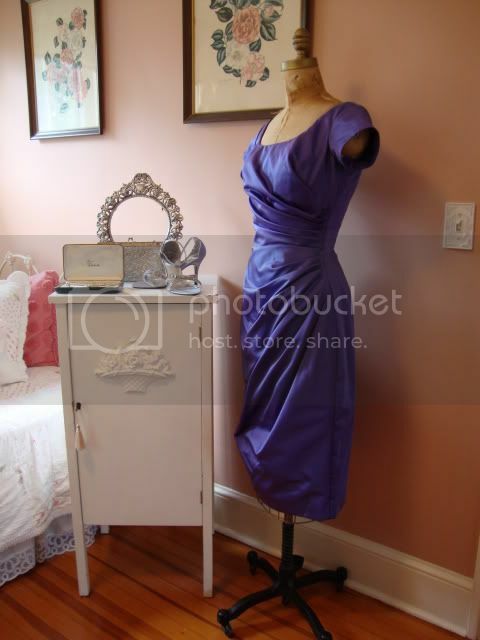 I am eager to interact with other like minded Vintage Lovers! I love every picture in this post! I know you just looked fabulous wearing some of these treasures! 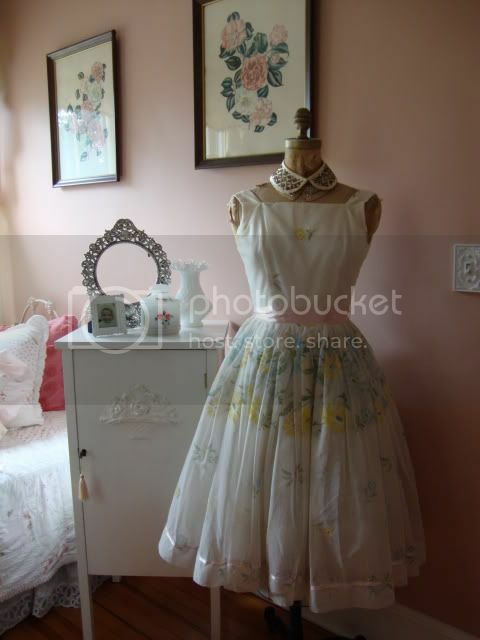 The dresses fitted at the waistline remind me of the ones my momma wore when I was a little girl. Wish I could say I could wear them now, but my waistline has seen better days after two children (and that's been a while, too)!! Amazing vintage finds! I love them all!!! Thank you Jannah! I actually have a new idea where I feature some of the gorgeous family hand me downs I have received over the years. I think you just inspired me to get to work on that one!